There are never two of the same when it comes to fine jewelry made with natural opal gemstones. Like us, there are never two opal gemstones exactly the same. 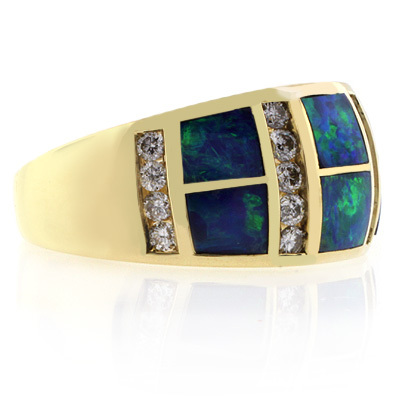 This stunning Natural Australian Blue Opal bezel set in Solid 14K Yellow Gold, the ring being especially handmade for the natural opals and genuine diamonds. You will fall in love with the brilliant play of colors of this opal ring, delightful each of its colors. Make this your signature ring or get it as a gift for that special person. This ring will surely express yours or your loved ones' individuality perfectly. The rings has 0.45 ct tw genuine diamonds and Natural Australian Opals.